Chief protagonists in the arms race for ever more powerful Mercedes-Benz models, AMG has come from humble beginnings to a position integral to Mercedes' global plans. Andy Enright reports. I'm sitting in the pit lane at Goodwood motor racing circuit in a Mercedes-Benz SLS AMG. I've only ever been to the fierce little circuit that ended the racing career of Sir Stirling Moss once before and that had been a slightly chastening experience. To add to the intimidation factor, I have former F1 World Champion Jody Scheckter sitting alongside me. If I get this badly wrong, it won't just be embarrassing, Waitrose will lose a key buffalo mozzarella supplier. While Scheckter chats happily about his organic farming methods, I try to remember turn in cues, apex clips and braking points. It's not really happening so I do what is probably the most natural thing, trust my talent and the ability of the car. It's kind of a 20:80 ratio. The SLS AMG is immensely capable. It flatters my clumsy trail braking and blends seamlessly my overzealous throttle applications. A car that I'd previously thought of as something of a 'point and squirt' hot rod is anything but. It's a vehicle that was developed by AMG as a true showcase of their abilities, frustrated as they were in being sidelined during the rather unhappy Mercedes McLaren SLR collaboration. Such is the glamour associated with AMG that it's easy to forget quite what humble beginnings the company endured. It started out in 1967 in a rather dingy mill house in Burgstall an der Murr, near Stuttgart by Hans Werner Aufrecht and Erhard Melcher, the 'A' and the 'M'. In case you're wondering, the 'G' part of the name is a bit of a red herring, Grobaspach being Aufrecht's birthplace. Aufrecht and Melcher were talented but rather underfunded engineers, specialising in tuning racing car engines. It took fully four years for their talents to be recognised on a wider scale, with an AMG-tuned Mercedes-Benz 300 SEL 6.8 taking a surprise class victory in the 24-hour race at Spa in Belgium, finishing in second place overall. The next five years saw AMG grow rapidly, bringing on more employees and cementing their partnership with Mercedes. The company outgrew its base in Burgstall and moved to Affalterbach in 1978, retaining Burgstall for racing operations.At this time Erhard Melcher ceased to be a partner, but continued to be an employee at the Burgstall location. AMG, in effect, became Aufrecht's responsibility. AMG upgrade packages to the original SL and SLC models were offered by Mercedes and engine upgrades and styling packages soon spread to other models in the range. Further success required another move in 1985 when the company opened 'Werk II', its second factory, and welcomed aboard its 100th employee. With Werk II on stream and unwilling to be seen as merely a supplier of cosmetic products, in 1986 AMG developed 'The Hammer' a showcase of its tuning potential. This took the Mercedes 5.6-litre V8, as seen in its range-topping S-Class and shoehorned it under the bonnet of the smaller and lighter E-Class saloon. Tuned to produce some 360bhp, it was a seriously potent statement of AMG's expertise and is still a cult collector's car to this day. 1990 was pivotal for AMG. After years of less formal agreements, it signed a cooperation agreement with Daimler-Benz AG which meant that AMG-branded products would be sold directly through mainstream Mercedes-Benz sales and service outlets and dealers, massively improving the exposure and credibility of the brand. Further expansion led, in 1990, to the opening of 'Werk III', the third factory, and an increase in the workforce to 400 employees. Just three years later the first co-developed AMG-branded production model, the C36 AMG arrived in dealerships. It proved an immediate success, shifting over 3,000 units betwwen 1993 and 1997. This car started as a 280 Elegance plucked from the Mercedes production line and was treated to a thorough makeover. The best part? A 3606cc straight-six that could produce 280bhp and the ability to sprint to 60mph in just 6.9 seconds. The C36 was replaced in 1997 by the C43 AMG, this time featuring the same low-key exterior, but with AMG taking responsibility for a greater share of the build process. The 4266cc 306bhp six was, conversely, more closely related to standard Mercedes fare but it was quick, taking just 6.5 secondsto 60mph. Teething problems with wiring looms and gearboxes niggled at the reliability of both of these models, and AMG dabbled in the late nineties with hugely powerful versions of the R129-generation Mercedes SL. To this day, the SL60 AMG, the SL70 AMG and the SL73 AMG are vanishingly rare things, but the latter car's engine lived on in the Pagani Zonda, a hpercar to which AMG devoted significant engineering input. European spec E50 AMG and E55 AMG versions of the mid-range E-Class sedan followed but the car that really cemented AMG's reputation with Mercedes retail customers didn't arrive until March 2002. The SL55 AMG featured a supercharged version of Mercedes' tough 5.4-litre V8, boosted in this instance to 476bhp. It genereated a monstrous 531lb/ft of torque, which is put into stark relief by the fact that the supercar benchmarks of the time were cars like the Ferrari 550 Maranello which managed 419lb/ft and the Lamborghini Murcielago which could crank out a mere 479lb/ft. The Aston Martin Vanquish and the Porsche 911GT2 couldn't get close to that figure. In a performance test undertaken by Autocar magazine, an SL55AMG was divested of its speed restrictor and proceeded to give all of these cars a good larruping in a sprint to 300km/h (186mph). Trailing in last was the tardy old Ferrari 550 with an elapsed time of 61.2 seconds. The Aston romped to the benchmark in 55 seconds while the Porsche lopped over 14 seconds off that showing, taking a mere 40.9 seconds. The Lamborghini Murcielago zipped to the triple ton in 34.5 seconds, but even Sant'Agatas finest had to give best to the Mercedes. Requiring only 32.5 seconds, the SL55 AMG bested all comers, running on to 202mph and that was before AMG upped the power to 517bhp in 2006. 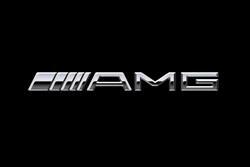 Most would say that at some time thereafter, AMG lost its voice a little. It became a badge that was applied to the fastest model in each respective Mercedes model line, much as the once-proud Ghia badge had become devalued by Ford in the Seventies. To put it bluntly, the Noughties brought us quite a few rather forgettable AMG-badged cars with a heck of a lot of engine and little in the way of handling subtlety. Vehicles like the SLK32 AMG and the ML55 AMG spring to mind. Things reached a head when the mighty 612bhp twin turbocharged engine appeared in SL, CL and S-Class variants. Hugely rapid, but catastrophically thirsty and with very poor weight distribution, these cars were running fast at the buffers of an evolutionary dead end. Better news arrived in 2007 when the M156 6.2-litre V8 started to appear in the MAG range. This engine was developed for use in the DTM racing series and was a lighter, more responsive and charismatic powerplant than the big turbo bangers. It also seemed to galvanise AMG into producing lighter, more responsive and charismatic cars around it. All of the M156-engined models initially used the excellent 7G-Tronic automatic transmission, with later 2009 SL 63 and 2010 E63 using the very clever 7-speed AMG Speedshift MCT gearbox. A development of the M156 engine (dubbed the M159) was then used in the SLS AMG. The M156 was slowly phased out through the Mercedes range, superseded by the M157 5.5-litre V8 twin turbo which offered vastly better emissions and fuel economy figures with no power deficit. The wider M157 engine wouldn't fit beneath the bonnet of the fantastic C63 AMG, probably my favourite AMG of the lot. Available in saloon, estate and from 2011 coupe versions, the C63 demonstrates how AMG and Mercedes have got their mojo back. It's a joyous car to drive, full of snarl and attitude but with no small reserve of handling prowess. The track-focused C63 AMG Black Series coupe takes its cue from its 2007 predecessor, the awesome CLK 63 AMG Black Series, in offering a road car that feels like a barely sanitised touring car racer. AMG may have lost its way a little a few years ago but it's right back on track now, producing cars that keen drivers will love. It's come a long way since two guys were hand finishing engines in a badly-lit mill house, but the spirit of competition lives on.